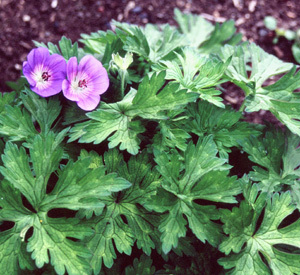 Joy Creek Photo Archive (c) all rights reserved The violet blue flowers of Geranium 'Rozanne' are 2 inches across. Their pale centers have magenta veining. The anthers are black and show up against the pale centers. The foliage is mid-green turning fiery red in the autumn. And the flower stems are red. No wonder this was selected as a Great Plant Pick! Summer to first frost. 24 in. x 20 in.